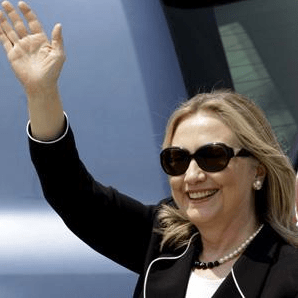 US Secretary of State, Hillary Rodham Clinton waves upon arrival in Kolkata, India, Sunday, May 6, 2012. BY Kurt Achin | New Delhi – Secretary of State Hillary Clinton is in India for two days of meetings on topics ranging from Iran to Wal-mart. Clinton has chosen to make a regional capital her first stop, rather than New Delhi. Secretary of State Hillary Clinton arrived Sunday in Kolkata, the capital of India’s West Bengal state – an itinerary that partially has to do with its proximity to neighboring Bangladesh, where she spent Saturday. But many observers also see it as significant that the first major meeting on Clinton’s agenda is with West Bengal Chief Minister Mamata Banerjee on Monday. Banerjee’s party is a key coalition partner with India’s ruling Congress Party, and Banerjee herself has been a major roadblock to Indian efforts to open its markets for foreign direct investment in retail. Last year, Banerjee forced the government to roll back an order which would have allowed American companies like Wal-mart to own a 51 percent stake in multi-brand retail operations, including those that run supply chains for food and agriculture. Economist N. Bhanumurthy, of New Delhi’s National Institute of Public Finance and Policy, says the episode embarrassed the national government and increased the leverage of Mamata Banerjee. Clinton is also expected to discuss a stalled agreement to share water from the Teesta river with neighboring Bangladesh, a deal Banerjee has also opposed in its current form. The secretary of state heads to the Indian capital late Monday for meetings with Indian leaders. They are to lay the ground work for a U.S. – India strategic forum scheduled next month in Washington. Clinton is expected to push the Indian government to continue reducing its dependence on oil from Iran by opting to buy from other countries. The United States and Europe have sanctioned Iran to discourage what they believe is Teheran’s nuclear-weapons program. India does not support those sanctions, but has quietly been reducing its oil purchases from Iran. Regional stability in the context of the planned 2014 U.S. military pullout from Afghanistan is also to be on the agenda for the New Delhi meetings. Clinton is also expected to raise the issue of civil nuclear cooperation between the two countries, which has been stalled by an accident liability law passed in India two years ago. U.S. nuclear corporations feel the scope of the damages to be paid in the event of a nuclear accident unfairly biases India’s nuclear market against private American corporations in favor of state-owned nuclear companies in Russia and elsewhere.